Light onshore winds and small bumpy waves on the Surf Coast yesterday morning, improving into the afternoon as winds switched offshore, while the beaches to the east improved through the morning and remained glassy into the afternoon with good sized sets. Today the swell has eased off a little more though all locations are clean and fun with the beaches east of Melbourne the pick, smaller and slow on the Surf Coast. A shallow onshore change has since moved through creating bumpy conditions. The coming weekend isn't looking too flash hot, though there's been a slight upgrade in the swell due tomorrow, along with a window of more favourable winds. A weak mid-latitude front is currently moving in from the west towards us, generating a small fetch of 20-25kt W/SW winds. A small weak W/SW windswell is expected off this front, providing 1-2ft waves max on the Surf Coast magnets tomorrow and 3ft sets on the Mornington Peninsula beaches. Winds will be average and generally SW, though the Torquay region is likely to see an early W'ly. The swell will drop through Sunday and a light onshore S'ly breeze will create OK conditions but there'll be no size or power available. Moving into next week, and our long-period W/SW groundswell event has been upgraded, with the strong tight low that's formed in the Heard Island region -c urrently south-west of WA - due to strengthen slightly while pushing under the country. The low was expected to weaken after generating a fetch of severe-gale to storm-force W'ly winds in our far swell window, but we're now expected to see the low continuing to generate severe-gale W'ly winds while slipping more into our south-west swell window. We were due to see an inconsistent long-period W/SW groundswell mixed in with mid-period SW swell, but now we'll see a good and fairly consistent long-period SW groundswell filling in Monday with smaller less consistent W/SW energy in the mix. We're now due to see the swell building rapidly through Monday, arriving during the morning and kicking to 4-5ft on the Surf Coast into the afternoon and 6-8ft on the Mornington Peninsula but with that moderate S/SE breeze. 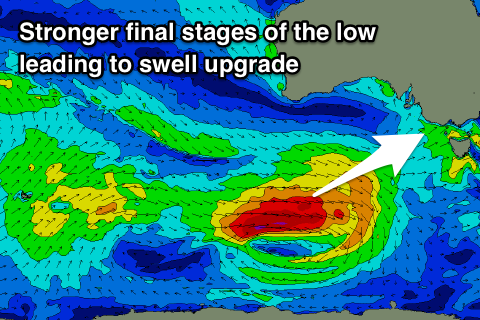 Still with the strength of the swell there should be some decent options across the state. The swell should ease through Tuesday from 3-4ft and 5-6ft+ respectively and winds look to be possibly variable out of the E/SE, though most likely onshore out of the S/SE. We'll review this on Monday but in either case there should be some fun options again. Wednesday will be smaller again with moderate to fresh S/SE winds kicking back in, while the end of the week looks windy and poor with a deepening mid-latitude low south of WA drawing in strong E'ly winds. More on this Monday though. Have a great weekend!